Well, I had really hoped to end my road racing season on an exciting, over joyous note with a PR, but alas it was just not in the cards for me (once again). As embarrassing as this is to admit, for the first time finishing a race I actually cried...and not the good kind of tears. I was crying because of how disappointed I was in myself. I felt ridiculous - I mean there are so many more important things in life than running a PR in a marathon. But I had trained for months, put in the work, and I wanted to have something to show for it. So there I was pathetically crying at the finish line. But alas, sometimes God has other plans for you. Before this race I was already planning to switch my focus over to trail running once it was over - but as I struggled through the last few miles it really hit me that it was the right decision. Running is supposed to be something that brings me joy. Not causes me to cry over running a 3:51 marathon instead of a 3:40 marathon (which is still a perfectly acceptable time - even my 3rd fastest marathon). Now that the dust has settled, I'm still disappointed, but it doesn't feel as upsetting now. I mean it really is JUST running. My livelihood does not depend on running a certain time. I still got the same medal that the last place person got. So I am trying to find peace in it...and also get excited for my trail running season to ramp up! I'm planning to take the month of May somewhat easy - I still want to log a decent amount of miles, but not in an overly structured format. I also really want to start getting more strength and core work into my routine in a regular basis. So I have that to look forward to. June I'll start building up my mileage as I start to get back into Ultra's. I hope to do a self-supported unofficial "50K" sometime in the latter half of the month, and then July I've got Chase The Moon 12 Hour Endurance Run, followed by my, gulp, 100 miler in late August! I am really excited for all of this, but it's also scary! It's been awhile since I went for a new distance. I love the excitement and accomplishment that comes with that challenge though, so lets just hope it all works out well!!! Anyways, back to the Colorado Marathon which is what I'm supposed to be talking about here. I was a bit of a mess in the week leading up to the race. The weather was super questionable. At first it wasn't going to be so bad - low in the 30's, high in the 50's with a 20% chance of rain. But as the week progressed the weather got more and more iffy - colder with significantly higher chances of rain or even snow. I've honestly never ran a road marathon in anything other than a skirt and t-shirt or tank and so I had NO IDEA what to wear. I finally settled on capri's and a long sleeve shirt with my Team Beef shirt over it (P.S. this race is normally NOT cold. Last year I actually complained about how HOT it was - you just never know what Colorado weather is going to do in the spring!). Scott had the weekend off, so we drove to Fort Collins together on Saturday morning - arriving in the early afternoon. I was working the Skirt Sports Booth at the Expo from 3 to 8pm, so after making a quick drive around the CSU campus to see what had changed, he dropped me off at the Hilton where I picked up my bib and then worked it for awhile. It was fun to show people some of the new Skirt Sports items and of course I got a few for myself. Thankfully the race officials let us stay on the bus for quite awhile and I didn't have to get off until about 5:45 (the start was 6:30). 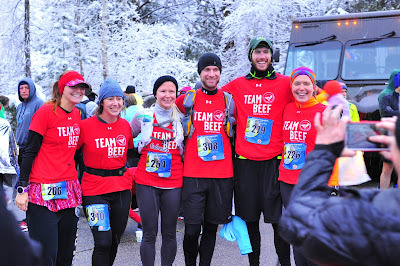 Once I did get off, I circled through the restroom line and then found some Team Beef members to chat with for awhile. Once we had a few of us, we gathered for a team picture before heading over to the start line. At 6:30 we were off! The surrounding mountains were snow covered and it was gently snowing, but the roads were just wet and thankfully not slippery (with the exception of 2 small bridges). It was one of the most beautiful scenes I've been able to run through and I really enjoyed the first 10 miles of this race. My plan was to run an 8:30 first mile, then in the 8:20's for a few more before easing into the teens. This is always easier said than done. I did run the first one right about on pace at 8:28, but the downhill felt so nice and smooth I had a few faster ones in the beginning (which maybe I shouldn't have done - it just feels so easy!) in the teens. Everything felt good though until mile 10. Shortly after 10, despite not wanting to admit it I did feel like I was putting a little more effort into 8:20's then I should've been. I still felt okay though so I kept at it through about the 13-14 mile mark. Around 15 is when I really realized I was not going to be able to keep an 8:20 average going. All of a sudden I was running 8:45 pace with the same effort I was running 8:20's at earlier. I really don't know what it was - maybe I went out too fast, maybe it was my fueling, or maybe I just didn't have a PR time in me today. Nevertheless I knew it was way too early in the race to pick up my effort - I still had over 10 miles to go! So I told myself to hold back in the 8:45 range for a bit and see if I could pick it up later. Unfortunately I was not able to pick it up later. I did manage high 8's through mile 20ish before slipping into mid-9's. Granted, part of slipping into the 9's may have also been myself just giving up since I knew a PR was out of reach. It's always tricky still giving it your all once you know you're not going to get that goal time you wanted. Especially when it hurts so bad...because it did. My quads were killing me by mile 22 from the downhill. I remembered this feeling back when I ran Phoenix last year. That one I did PR at, and had motivation to push through it. I did still try to push through this though and to help motivate me I gave myself another goal of 3:50. I did the best I could with this and had my garmin not measured the course long I, maybe, could've done it. But I finished in 3:51 on the dot. Still my third fastest marathon, but still a disappointment at the time. Looking back on it now, I try to tell myself - this is still an 8:48 average pace.. for 26 POINT 2 MILES! That's nothing to feel bad about. When I first started running, I couldn't even do 1 mile at 8:48 pace. Add to the the fact that my "easy" pace really is still 10 minute miles. To be able to push myself for that long is an accomplishment whether or not it felt that way at the time! My parents came up for the race as well and afterwards we went to Beau Joe's for lunch before heading back home! Congrats on finishing. I was there too and I know exactly how it feels to have a subpar marathon race. It stings for a while but eventually we all move on and set new goals and plans. The marathon is always iffy and you really never know what can happen. 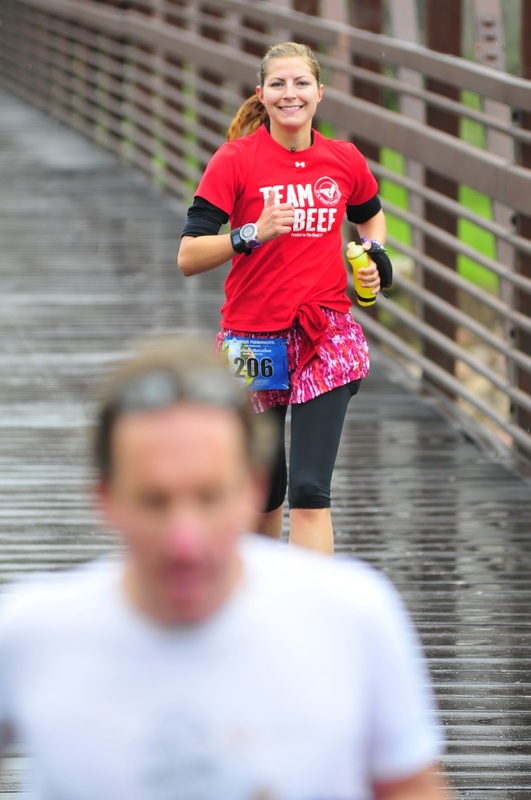 I really enjoyed the race and found the weather to be ideal (http://mchenryed.blogspot.com/2016/05/fort-collins-marathon-race-recap-fort.html). I'd rather have the weather that we experienced in Fort Collins versus heat.